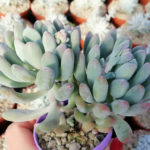 x Pachyveria ‘Clavifolia’ is an attractive succulent with up to 6 inches (15 cm) long stem, terminating with dense, up to 2.4 inches (6 cm) wide, Echeveria-like rosettes. The thick, flattish, up to 2 inches (5 cm) long and up to 0.5 inch (1.3 cm) wide leaves are a glaucous blue-gray with slightly pointed, blunted leaf tips. They are held slightly upcurved into a tight rosette at first but more relaxed with age, with the leaf tip and margins having a pinkish blush that is most prominent when grown in full sun. In spring and often other times throughout the year appears up to 2 feet (60 cm) tall, one-sided inflorescence, bearing star shaped, orange-red flowers tightly clustered near the pendent tip. Pachyphytum will not tolerate frosts well. Temperatures below 20 °F (-6 °C) will kill the plant, and temperatures which may go below 45 °F (7 °C) during extended period should be avoided. 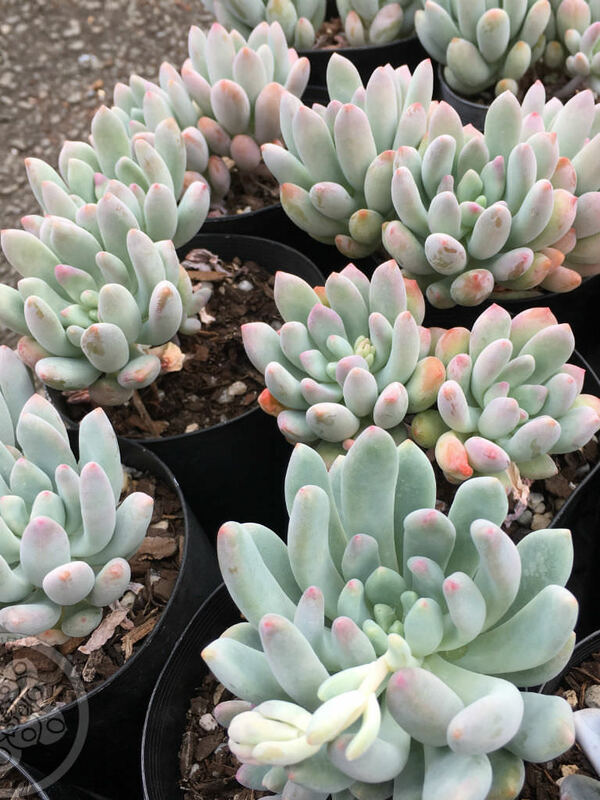 Pachyphytum tolerates high heat and intense sunlight. 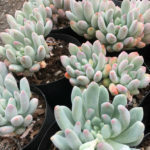 As with most Crassulaceae, Pachyphytum can tolerate (and even appreciated) poor soil conditions, so long as it is well draining. 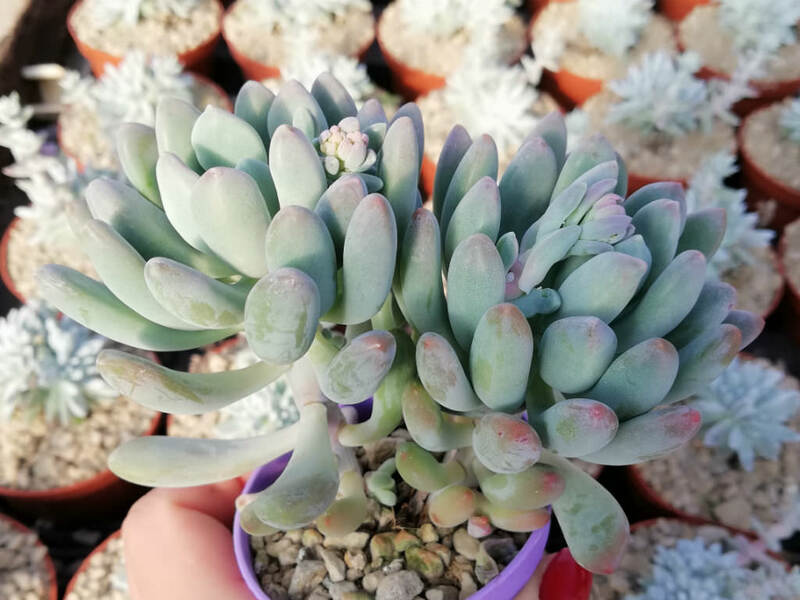 Pachyphytum can thrive in full or partial sunlight. Allow the soil to dry out before watering, and be careful to avoid getting water on the leaves. In winter, the plants will require more water, as winter begins its active growth season. 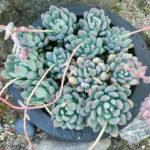 If you are unsure when to water your Pachyphytum, watch the lower most leaves for signs of drying and water them then. 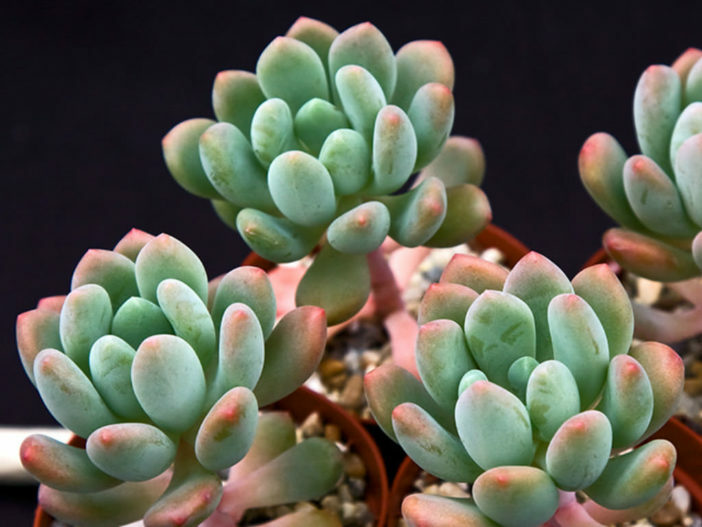 Pachyphytum is FAR more likely to survive under-watering than over-watering. The thick fleshy leaves will appear wilted and a bit “under-full” when they need water. 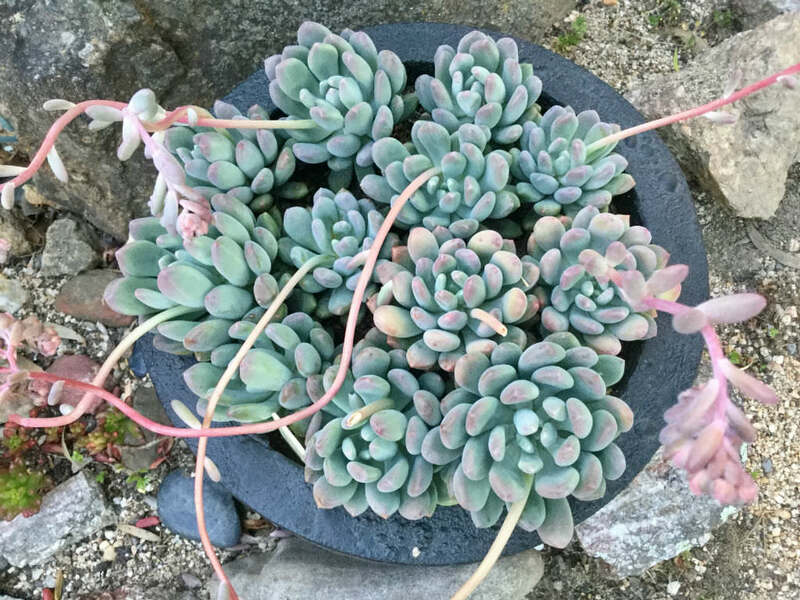 x Pachyveria ‘Clavifolia’ is an old hybrid between Pachyphytum bracteosum and Echeveria rosea, created by Jean-Baptiste A. Deleuil of Marseilles created in the late 1800s.